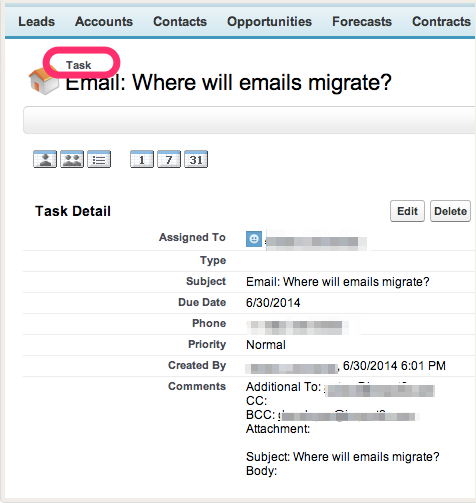 We migrate emails as Tasks by default, since Salesforce considers these to be Tasks. We have investigated the new Lightning edition of Salesforce with the advanced email feature, but there are too many nuances for us to guarantee this will work with your migration. As such, we will not be able to implement this as a feature. For more information on the advanced email feature, please see here. If you would like to speak with us about building this as a customization for your migration, please send us a message so we can discuss the options together. Please be advised there will be an additional cost associated with such a request. Additionally, if your source CRM is one which stores emails that are only implicitly referencing contacts, (i.e. they don't have direct relation to the contact/lead/account), these will not be imported by default as Salesforce doesn't have a feature like that. We can build a custom script to mimic this functionality and attach emails to contact if the email matches. This would be charged additionally. Please get in contact with us if you would like to get the quote.